Laika Roen has always been strangely attracted to Lisan, a mysterious and isolated country where the citizens worship their despotic leader. When Laika suddenly receives an invitation to travel to Lisan as a visiting scholar, she abandons her career as a private tutor to pursue adventure in Lisan. But Laika gets more than she bargained for when her trip is disrupted by violence and she's forced to set out on her own. 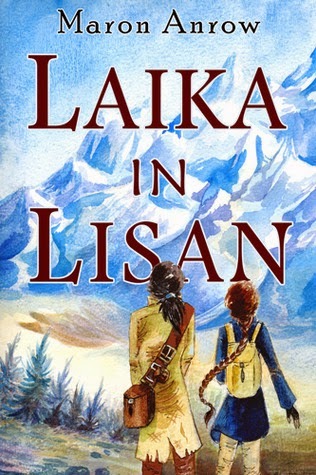 As she journeys through forbidden sections of the foreign country, Laika discovers horrible truths about the relationship between Lisan's leader and his people. Can a simple scholar change the course of an entire country? And even if she can, should she? The distinction between right and wrong blurs as Laika explores not only Lisan, but her own conscience. Maron Anrow contacted me to ask if I would review her book. I was more than happy to do so at the time, but now I feel entirely honoured to have been asked. This book is wonderful, and I absolutely loved it. The world Anrow shows us is very believable, very terrifying, yet completely fascinating. Set some years in the past, Lisan is a dystopian country run by a complete tyrant, with his son and heir, rumoured to be even worse than his father, waiting to take the reigns. It's out and out totalitarianism, with dashes of communism, very much akin to the way some countries are run in our world to this day. The way the people in Lisan are treated is shocking; forced from a young age to love and respect their leader, who drinks imported wine whilst the populace starves. Although it's difficult to believe this could happen in our world, the plot is similar to that of something you could see on the news today. Laika is a gorgeous protagonist. She's intelligent, brave, and driven, but shows us her softer side at the best of times. We often see female, young adult narrators as incredibly strong-willed, but who will fall apart when a male comes on the scene to seduce them. Laika is smooth and subtle around her love interest, but shows us her emotion when it comes to grittier parts of the novel. This makes her entirely endearing, and completely believable. Most of us girls can work our way around a charming man without batting an eyelid, but overthrowing a government might be a little challenging. The decisions Laika has to make over the course of the novel give a good message about the notion of right and wrong, particularly in relation to war. Is there anything you wouldn't do for the greater good? Should you be willing to do awful things for the greater good? Or is your own life and morals more important? What happens when the plan backfires? Anrow explores all of these issues, and summons up some great points of debate. I loved reading about the cultural differences between Trea and Lisan. I liked entering Lisan with Laika and seeing how they did things in contrast with Trea. I would've loved a bit more cultural exploration, and would've liked to have heard more about the Lisan towns, and their quirks and industries. I particularly loved the idea of the 'labour gardens' - prisons with a fluffy name. It was clear Anrow either did a lot of research into politics, economics, and foreign relations, or she's just as intelligent as her protagonist. I'm an amateur when it comes to these things, so seeing a despotic leader, his constituents, and learning how it all came to be, thrilled me. Laika in Lisan is an compelling read which examines some important themes. Laika's story is addictive, the characters vibrant, and the shape of things to come so dismal, that you can't help but become engrossed. I'm so grateful to the author for sending me this, and only hope she will keep me in mind should she (fingers crossed) come to publish a sequel. This book made me realise I should read more indie authors, and put more energy into getting their books recognised. This was truly wonderful, and it makes me angry that there are some truly dreadful but famous books out there, when this one is brilliant, and desperate to be read.